Dimitris Kyriazakos at Ekka Yachts has just sold a new Ferretti 29.26 metre motor yacht. Built in GRP by Italian yard Ferretti to a design by Zuccon International Project, she was launched in 2016 as the 14th hull in the Ferretti 960 series. The interior is decorated in natural oak and walnut woods with white ceilings for a fresh, contemporary air. Accommodation is for 10 guests in five cabins consisting of a main deck master suite, two double and two twin cabins, all with entertainment centres and en suite bathroom facilities. In addition, five crew are accommodated in three cabins. The main saloon has large windows while on the port side is a large contemporary U-shaped sofa and coffee table on an accent rug. To starboard there is a bar in the aft corner made of dark oak while forward of the bar is light oak cabinetry featuring an upgraded 55 inch television on a remote controlled rise and fall mechanism. The flybridge and the aft deck are entirely devoted to leisure, with built-in furniture and tables offering several areas for al fresco entertaining and dining. Uniquely for a yacht of this size, she features a floodable tender garage while the bathing platform can be immersed in the water to allow for the launching of the tender in just a matter of minutes. With her waterline hull length of 23.98 metres, she falls just within the category that allows her to be driven without a yacht master or professional certificate – a considerable attraction for prospective owner-operators. Twin 2,600hp MTU diesel engines power her to a top speed of 30.5 knots and she is fitted with zero speed stabilisers. 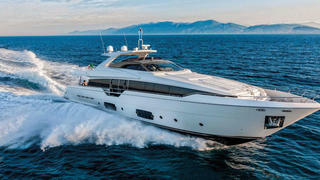 The Ferretti 960 has a list price of €7,900,000.